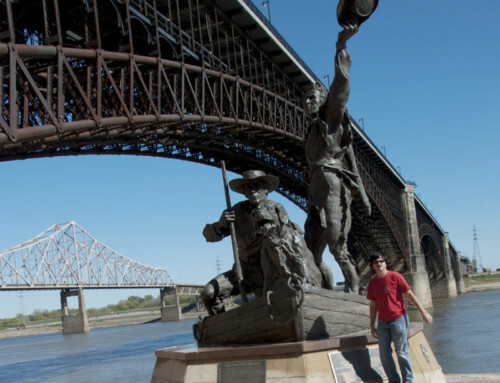 It’s been 250 years since France governed the Mississippi Valley, but their influence is still alive along the Mississippi River from St. Louis to Sainte Genevieve. Many of these communities pre-date the founding of New Orleans and have preserved impressive remnants of their earlier days. It’s possible to take a day trip through this area and see most of the sites, but two days would be a more rewarding pace. Outside of St. Louis, most of the lodging and dining options are in Sainte Genevieve, Missouri, and Chester, Illinois. Still have questions? Contact the folks at the Sainte Genevieve Department of Tourism. French-Canadian missionaries arrived in the mid-Mississippi River Valley in 1698 and established a settlement at Cahokia the following year, the same year that the village of Williamsburg, Virginia, was founded. The missionaries left Quebec on a mission to convert Tamaroa Indians to Christianity. Besides Cahokia, other settlements sprang to life in the rich bottomlands along the Mississippi River: Kaskaskia (1703), St. Anne’s (1719), St. Philippe (1723), Prairie du Rocher (1722), and Sainte Genevieve (1749). These settlements were compact in size with small populations organized around agriculture. Each family farmed its own plot, but there were also common fields that residents shared to graze cattle and harvest wood. The residents of these communities often included blacks—some free, some enslaved—and a substantial number of Indians. A brief summary of the development of the main communities is in the next section. One of the oldest communities along the Mississippi River, Sainte Genevieve was founded around 1749 by French-speaking farmers who relocated from Kaskaskia, Illinois. Nearly three centuries later, the center of town still resembles a French colonial village. At the time of Sainte Genevieve’s founding, there were no resident American Indians, although Osage Indians occasionally hunted in the area. Long before that, the Mississippian culture centered upriver around today’s St. Louis built settlements in this area. Early Ste. Genevievens found eight large platform mounds in the area where they decided to farm; those mounds have been nearly erased over time by continual cultivation on top of them. Late in the 18th century, some American Indians conducted occasional raids on the village, but trading relationships eventually developed around fur that blunted much of the hostility. The village got a boost around 1763 after Britain gained control of France’s Illinois country. Many French families relocated across the Mississippi River to places like Sainte Genevieve to avoid British rule. In 1773, Sainte Genevieve counted 676 residents, 276 of whom were enslaved blacks; forty percent of families owned at least one enslaved worker. The first farmers built on the floodplain about two miles south of the current town site. After a major flood in 1785 (l’année des grandes eaux), most of the residents relocated to the higher ground (les Petites Côtes or little hills) where the city is today. Residents lived in town while farming long, narrow lots in fields on the edge of town. Tobacco, maize, and wheat were the most common crops. Folks made a pretty good living, but they also knew how to have fun. The village had three billiard halls in the 18th century, and gambling was popular, especially on Sundays after church. English-speaking settlers began moving to Sainte Genevieve at the end of the 18th century. In 1800, Sainte Genevieve’s population had grown past 1,100 residents, nearly one-third of whom were enslaved. The famous naturalist and artist John James Audubon moved to Sainte Genevieve in 1811 to set up a mercantile business with his friend, Jean Ferdinand Rozier. Rozier took to the business world well (and still has many descendants in the area). Audubon did not, but he later found his niche drawing and studying wildlife. German Catholics began settling in Saint Genevieve around 1840. They built sturdy masonry structures with locally-fired bricks, like the Firmin Rozier Store (c. 1850) and the John Hael house (c. 1860). By the mid-1800s, there were more people in town with German than French ancestry. For a brief time, Ste. 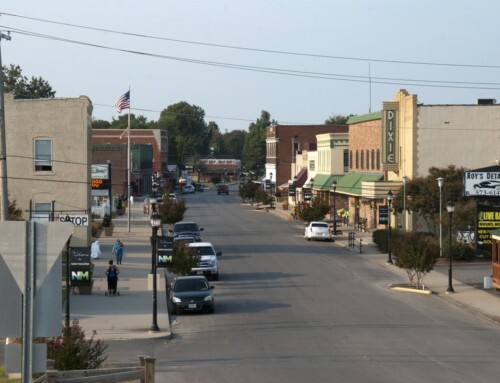 Genevieve had a busy river port for shipping iron ore from the Missouri mines, as well as granite and marble, but the railroad eventually captured that business. 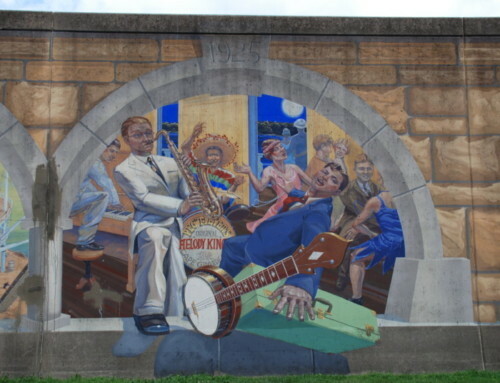 After the Civil War, newly freed African Americans settled in the south part of the city; in the 1920s, a small wave of African Americans migrated to the city from the South to work at the lime factory. In 1930, three of the newer residents were accused of robbing and killing two white men. The three were arrested and jailed in St. Louis, but that wasn’t enough to satisfy a group of white vigilantes, who stormed the black neighborhoods, going door-to-door and ordering everyone to leave town. Virtually all did. The state sent in the National Guard to restore civil order, and long-time black residents were invited to come back (but not the newer migrants). Many returned, but most no longer felt welcome and didn’t stay. By 1960, the city’s black population had declined from two hundred to just sixteen; it has rebounded somewhat since, now numbering around seventy people. Ste. Genevieve threw a big party in 1935 to celebrate its bicentennial, back when most people identified the founding year as 1735. Dignitaries from around the country visited the city; even President Franklin Roosevelt called to congratulate residents. The highlight was a live show called Fair Play, which was written and directed by a priest from nearby Perryville, Missouri—the Reverend JB Platisha. The city dammed Valle Spring to create a lake for the production and built a 14,000-seat arena around it. In the middle, they built a triangular stage with a model of the old village. The show premiered on July 27, 1935, with a cast of 1,200— yes, 1,200! During the show, the little island was covered with water to simulate the 1785 flood. The whole celebration was a big hit. The Frisco line ran a charter train from St. Louis, and thousands of people rode it every day. The event was among the first efforts to promote Ste. Genevieve as a tourist destination. Today, tourism plays an important role in the city’s economy, as does lime processing, which is still going strong. NOTE: This chapter focuses on the areas south of the St. Louis metropolitan area, but don’t skip the French Colonial sites near St. Louis, especially Holy Family church in Cahokia, Illinois. See the St. Louis chapter for more details. Sainte Genevieve has an impressive collection of French colonial architecture. The most common types of construction were post-on-sill (poteaux sur solle) and post-in-the-ground (poteaux en terre). In both cases, logs were aligned vertically instead of being laid flat like American log cabins of the era. The Louis Bolduc House (123 S. Main St.; 573.883.3105) was originally built in 1770 in the lowlands but Monsieur Bolduc rebuilt it in the post-on-sill style in its current location in 1792-93. The house has been restored to its late 18th-century appearance, and even includes a few furnishings original to the Bolduc family. In 1824, Felix Vallé purchased Jacob Philipson’s six-year old federal-style home and turned it into a trading post. The Felix Vallé House is now part of the Vallé State Historic Site (198 Merchant St.; 573.883.7102), which also includes the Bauvais-Amoureux House, one of only five remaining post-in-the-ground houses in the US. The Bauvais-Amoureux House was built by Jean Baptiste St. Gemme Bauvais in 1792. Inside you’ll find a diorama of 1832 Sainte Genevieve. The Sainte Genevieve Museum (3rd and Merchant St.; 573.883.3461) showcases the village’s broad history, with exhibits on the American Indians who lived in the area, as well as the region’s Spanish and French periods. Magnolia Hollow Conservation Area (573.290.5730) offers hiking through 1,740 acres of protected floodplain forest and to blufftop overlooks next to the Mississippi River. Take I-55 north to Bloomsdale, then go one mile east on County V and north on White Sands County Road (a gravel road) to the entrance. The rolling hills around Sainte Genevieve are home to several wineries. Check out the Route du Vin for a complete list and descriptions of the wineries. If beer is more your thing, Charleville (16937 Boyd Rd. ; 573.756.4537) brews several styles of beer, in addition to the wine they make, so there’s something for everyone. Crown Valley Brewing and Distilling (13326 State Highway F; 573.756.9700) brews its own collection of beer and cider, plus they make their own distilled beverages, including moonshine, absinthe, whiskey, gin, and vodka. For something completely different, take a walking tour of the Crown Ridge Tiger Sanctuary (19620 State Route B; 573.883.9909), a retirement home of sorts for tigers rescued from difficult circumstances. Guided tours are offered Thursday through Sunday (11a,1p,3p) from April through November. Pick up some fresh, local produce at the farmers market; vendors set up in the parking lot at 600 Market Street on Saturday mornings. The Sainte Genevieve County Fair takes place in mid-July at the Fairgrounds (22079 White Sands Rd. ; 573.880.1979); look for the usual livestock judging contests, tractor pulls, and live music. The biggest annual celebration in Sainte Genevieve is Jour de Fete (August); it features vendor booths on streets that snake their way around the old town area, as well as live music. One of the old French cultural traditions that has survived in Ste. Genevieve is La Guillannée (pronounced as gee-oh-nee with a hard “g”), a tradition that goes back to Medieval times (or earlier) in which folks dress up in costumes—some of them quite unique—and roam the city’s streets on New Year’s Eve, singing songs and begging for favors. It’s quite fun. **Sainte Genevieve is covered in Road Tripping Along the Great River Road, Vol. 1 and Small Town Pleasures. Click the links above for more. Disclosure: This website may be compensated for linking to other sites or for sales of products we link to. Oberle Meats (21529 Missouri Highway 32; 573.883.5656) has been producing popular and tasty smoked sausages and meat products for five generations. Pick up something for a picnic later. For a good cup of coffee or freshly-prepared breakfast or lunch, head to Beatnik Cafe and Pastry (122 N. Main St.; 573.608.5055). Sirro’s Restaurant (261 Merchant St.; 573.883.5749) is a popular choice for pizza and sandwiches. Stella and Me Café (198 N. Main St.; 573.883.3078) is a good choice for a lunch of soup, salad, or a sandwich, plus a little something sweet at the end. At the Anvil Saloon (46 S. 3rd St.; 573.883.7323), dine on classic American cuisine in a warm, cozy space; for something different, try the liver dumplings, a local specialty. The bar was salvaged from a 19th-century steamboat. 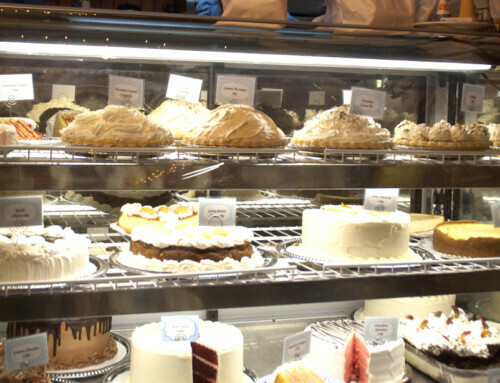 The Garten Haus Restaurant at Weingarten Vineyard and Winery (12323 Rottler Lane; 573.883.2505) specializes in panini and oven-fired pizzas, but evening meals go a bit more upscale. The Grapevine Grill at Chaumette Winery (24345 State Route WW; 573.747.1000) emphasizes local ingredients in season to prepare classic American fine dining entrées, some with a hint of Cajun or Southwest influence. The Vintage Grill at Crown Valley Winery (23589 State Route WW; 866.207.9463) emphasizes a farm-to-table experience, so the ingredients are fresh and the menu changes regularly. Dr. Hertich’s House (99 N. Main St.; 573.883.5744) rents four suites with king beds and a room with a queen bed in the 1850 house of St.e Genevieve’s first doctor. The Inn St. Gemme Beauvais (78 N. Main St.; 573.883.5744) is an elegant, mid-19th century three-story mansion maintained as a time capsule of that era. The eight, reasonably-priced rooms and carriage house are tastefully furnished with a few antiques. Originally built as a hotel in 1882, Main Street Inn (221 N. Main St.; 573.880.7500) rents eight recently-renovated rooms that offer plenty of modern touches in the historic building. Somewhere in Time (383 Jefferson St.; 888.883.9397) rents three comfortable rooms named after characters or places from the movie of the same name. The stately Southern Hotel (146 S. 3rd St.; 573.883.3493) has been providing a home away from home for 200 years; the nine rooms on the second and third floor evoke Victorian splendor but come with modern amenities. A few miles south of Sainte Genevieve, White Cliff Manor Bed & Breakfast and Gardens (St. Mary: 200 2nd St.; 573.543.5445) rents four rooms in a 19th-century frame mansion surrounded by ten acres of blufftop land; wake up in the morning to a full breakfast of Creole-inspired dishes. The Villages at Chaumette (24345 State Route WW; 573.747.1000) is a collection of 26 modern country villas on the grounds of the Chaumette Winery that come complete with fireplaces and full kitchens; a simple continental breakfast is included but more elaborate breakfast options are available for an additional fee. Charleville (16937 Boyd Rd. ; 573.756.4537) rents two bed-and-breakfast rooms in a restored dog-trot cabin on the winery grounds. The Ste. Gen-Modoc Ferry (the French Connection, as some folks call it!) 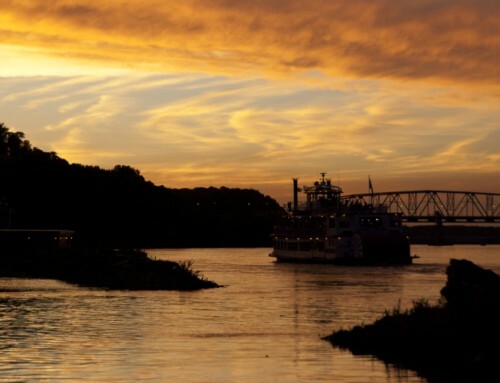 is one of the few remaining Mississippi River ferries; it connects Sainte Genevieve with rural Illinois. It’s a nice way to get some river time, even if you’re traveling by bicycle; they don’t accept credit cards. Heading upriver? Check out Crystal City. Heading downriver? Check out St. Mary.